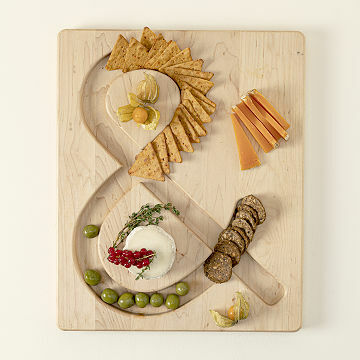 Celebrate the ampersand's elegant shape with this solid maple wood board for serving cheese and crackers. A snack spread simply isn't a snack spread without cheese and crackers. Highlight the all-important "&" with this text-friendly cheeseboard, made from North American maple and featuring a teak oil finish. When it's not smartly displaying a hearty feast of brie and rosemary crackers, this handsome design makes an artful addition to your kitchen sideboard or bar tabletop. Made in Dorset, Vermont. The Cheese & Crackers Serving Board was designed by UncommonGoods’ Product Development team, and produced by J.K. Adams. Our team's design responded to an apparent need to present an assortment of cheese and crackers in an organized and attractive way. The form of an ampersand presented a solution by providing the right distribution of spaces to organize the food. Our Product Development team collaborated with JK Adams to produce this concept in a high-quality maple board. The J.K. Adams Company was founded in Dorset, VT in 1944, by Josiah Adams. In 1949, the Cooper family purchased the company and has owned it ever since. In the early years, the company produced wooden drafting equipment, slide rules, and surveying equipment. The company also did contract wood manufacturing and produced products such as wooden shoe shine boxes. As technology started to replace many of these products, the company started to design and manufacture cutting boards and other housewares. Some of the houseware innovations attributed to J.K. Adams are angled knife blocks, in-drawer knife racks and numerous innovative cutting board designs. The company now employs 48 people, many of whom have been with the company for over twenty years. The company has been from it founding and remains committed to operating in an environmentally and socially responsible manner. The Cheese & Crackers Serving Board fuses form and function: the carved-out ampersand [&] provides decorative appeal as well as built-in channels to hold crackers, while the cutting board spaces between channels provide ample room for cutting and serving cheese. "Our mission is to put a J.K. Adams product in the hands of every person who is passionate about their kitchen, about the food they make, and about the connections made while entertaining with good food and good friends. We will design and produce products that are exceptional from a functional, aesthetic, and quality standpoint and will always stand by them with a full 100% replacement guarantee. We will continually work to prove that well run companies with committed and customer focused employees can grow and prosper by producing high quality products in an environmentally and socially responsible manner in the United States." J.K. Adams pays employees a starting wage of $13/hr., which exceeds Bennington County's living wage. All full time employees receive 9 paid holidays and earn PTO based on years of service, from 1 to 4 weeks. They also receive 3 paid personal days off per year, available on January 1st and to be used within the calendar year. J.K. Adams recycles all of its primary material (wood). All of their scrap and by-product pieces of wood are collected and burned in one of two wood-burning furnaces, which in turn reduces their dependence on fossil fuels. The sawdust they generate is collected in two 20-foot containers and sold to local dairy farms. J.K. Adams has a long history of supporting local charities. These non-profit organizations include their local library, an organization focused on their local forests, a local theater, and organizations focused on numerous health and educational issues. In 2014, they provided these organizations with financial and product donations for events and auctions totaling $10,000. The company supports local farmers and producers. During the summer months, a local farm operates a produce stand two days a week from in front of their building, and in the winter, they host the Sunday Dorset Farmers Market in their manufacturing facility. North American maple and teak oil—natural source materials. The Cheese & Crackers Serving Board is packed in a partially recycled and 100% recyclable corrugated carton, which is also compostable. There's one place—and only one place—where you'll find the Cheese & Crackers Serving Board: UncommonGoods. 16.75" L x 13.75" W x 1" H; 5.25 lbs. Wash with warm soapy water and dry immediately. For long term care, apply mineral oil or beeswax wood conditioner every few months. I love everything about this item. I may have been one of the earlier purchasers, as i have had it for at least a year, if not two. The size allows for serving multiple cheeses for larger gatherings and there is room to cut on it. The size and heft also allow for the piece to almost serve as its own "table" ; it stays in place while in use. Surrounded by bowls of olives and dried fruit, this board makes quite a visual display. The natural oil finish is great - can be easily refreshed and it will only get better with age and use; I oiled mine twice over a week to get it "conditioned" before first using it. I find cleaning it a breeze, just brush out the cracker crumbs, use a flat scraper to remove any stuck-on cheese and a lightly damp paper towel to briskly wipe it down. People who leave wooden items in water should not be surprised when they run into problems... I realized after the first use that the slight ridges in the routed "&" have a functional purpose - to keep the crackers from sliding around. The "&" can hold quite a lot of crackers, and using a variety makes it that much more visually compelling; did I mention that I love this board? Just smashing!! Great look ! I bought one for my sister and myself. Just a great product which will be used many times. A cheese and cracker board that wows! A cheese & cracker board that woes! Gifted to my daughter who used it the next day! Everyone loved it! Bought it as a gift, kept it for myself. Board is well made, love that it's made in USA. Can you tell me how to care for it? I don't want it to dry out, can I oil it? And with what? This product puts a brilliant spin on a age old cheese and cracker display. Something unique that can not be purchased in local stores. Annie "Sister of the year"
Great product and great buying experience. I love how the crackers fit into the wells and stay in perfect order. This is beautifully crafted, looks awesome with nothing on it, and makes quite an impact when serving my charcuterie board at a party ... now if I could regularly remember how to say charcuterie ... LOVE THIS board. You won't be disappointed.